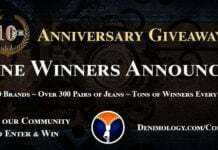 This week’s giveaway is sponsored by Canadian denim brand Guido & Mary who are giving one winner the opportunity to win $250 worth of jeans from their latest collection. The Montreal based brand was founded in 2000 and has become known for its amazing fits, soft denims and intricate embroideries. Over the last decade they have created a niche market appealing to customers who seek unconventional denim of the highest quality. WOW! I am loving that bell bottom trouser , and I love their collection on ther website!